French electronic duo Justice have been starting dance parties for a decade now, and they previously documented their live show with the 2008 album A Cross the Universe. 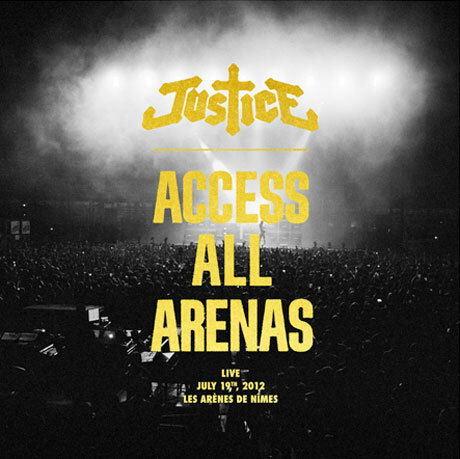 Now, they are preparing to release another live LP in the form of Access All Arenas, due out on May 7 through Ed Banger/Because Music/Vice/Elektra. The album was recorded at Arènes de Nîmes in France on July 19, 2012. According to a press release, the 14-song set "[offers] a taste of the wild effervescence that makes this duo one of the most exciting electronic live bands of the decade." The show was part of Justice's 105-show tour in support of their sophomore album, Audio, Video, Disco. The setlist is heavy on cuts from Audio, Video, Disco, but also includes several tunes from 2007's . See the tracklist below. To give fans a taste of Justice's recent live show, the duo have teamed up with Jay-Z's Life + Times website to share a nine-minute live documentary. Scroll past the tracklist to watch the documentary and learn more about the audio-visual experience. The Access All Arenas version of "On'n'On" is also streaming at the bottom of this page.